Free Shipping Included! Second Skin Damplifier Butyl Sound Deadener MADE IN THE USA - 5 Sheets (12'' X 24'' X 1 mm) = 10 Sq ft by SecondSkin at Atoz Car Rental. MPN: 10DAMP. Hurry! Limited time offer. Offer valid only while supplies last. Most noise problems in a vehicle are caused by vibrations from the structure. Typically created by, road/tires, engine, and base stereos systems. Most noise problems in a vehicle are caused by vibrations from the structure. Typically created by, road/tires, engine, and base stereos systems. This causes the surfaces, such as the floor, ceiling, and doors, to emit a drone sound like a cymbal on a drum set or a bell ringing. Damplifier uses 1 mm, 100% American-made, heat-resistant butyl rubber layer to absorb this vibrations energy, then slowly dissipates it through a 6.5 mil Annealed aluminum foil layer preventing this from becoming noise. MADE IN THE USA - 300% more efficient than tar boards and asphalt mats. The quality of the the butyl rubber and thickness of the foil create the overall effectiveness of any sound deadener. Roofing products are frequently labeled as sound insulation. 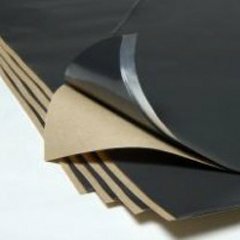 However they are typically made overseas from inexpensive alternatives to butyl rubber such as asphalt, tar, or bitumen with very thin foil or Mylar. Although less expensive, they are much lower quality, will not perform well, and may out-gas harmful vapors and/or melt and fall off. The true performance of Damplifier comes from details you cannot see, such as the unique chemistry of the high performance US made butyl rubber. Damplifier is made of 1 mm thick elastomeric butyl rubber with a 6.5 mil black annealed foil constraint layer. The thermal range is -75°F(-60°C) to 450°F(232°C). and will not melt, out-gas or fall off. Damplifier Pro is ROHS compliant, an EU standard restricting the use of 10 hazardous substances. CHAD UTT, WEST COAST CUSTOMS OPERATIONS MANAGER: "We skinned the entire vehicle floor, walls, doors, and roof with Second Skin Damplifier Pro and the Luxury Foam padding. I am blown away by how quiet and dead the sheet metal is. I would have to layer up competitor product three, four, sometimes five layers thick to achieve the same results. Awesome stuff man!!!!! Really, REALLY, happy with the product!!! " If you have any questions about this product by SecondSkin, contact us by completing and submitting the form below. If you are looking for a specif part number, please include it with your message. uxcell 197mil 6.4sqft Car Auto Exhaust Muffler Heat Sound Deadener Insulation Mat Pad Waterproof 40" x 24"